← 240 "Alone Again, Natura-Diddily"
The living room is a subway station. The family wait on a bench before getting on the train which arrives. "A belch is not an oral report"
Missionary: Impossible is the fifteenth episode of season 11. It originally aired on February 20, 2000. The episode was written by Ron Hauge and directed by Steven Dean Moore. Betty White guest stars as herself. "Homer becomes a missionary on a remote, tropical island as part of his effort to evade the local PBS affiliate's pledge drive collection officials." While watching the rowdy British sitcom, Do Shut Up on PBS, Homer becomes annoyed by the interruption of the telethon. In an attempt to end the pledge drive so they put the show back on, Homer pledges $10,000 to the network. Homer is applauded for saving the network: However, it quickly becomes apparent that Homer doesn't have the money. This prompts pledge drive host Betty White and a mob of characters and personalities from various PBS shows to chase him through the streets. Fleeing to the church ("Bingo! "), seeking sanctuary, he pleads for help from Reverend Lovejoy. Lovejoy gets Homer out past the PBS mob by hiding him in a bag, disguised as a sack of children's letters to God. Lovejoy then puts Homer on a cargo plane to the South Pacific, where he will become a missionary in Microatia until the heat is off, despite Homer's lack of religious faith (to the point, that he mistakenly calls Jesus, "Jebus"). Upon his arrival, Homer makes a call to Marge back in Springfield, during which he promotes Bart to "the man of the house", Lisa to "boy", Maggie to the "brainy girl" and the toaster to "Maggie", making Marge a consultant. Bart replaces Homer at the Springfield Power Plant, where Mr. Burns criticizes Homer's record and (not recognizing, who he is talking to) pokes Bart with a stick. After coming home from a hard day at work, Bart agrees to take Marge out for dinner one night. Homer meets Qtoktok and Ak. He also meets a native girl, who looks and sounds exactly like Lisa (Homer names her, "Lisa, Jr."). At first, Homer is so desperate, that he drops to the ground, writhing and crying, "Oh, God! ", repeatedly (which the natives all imitate, following his example). Homer eventually begins trying to teach them about religion, but realizing that he knows nothing about it, he tries something new. 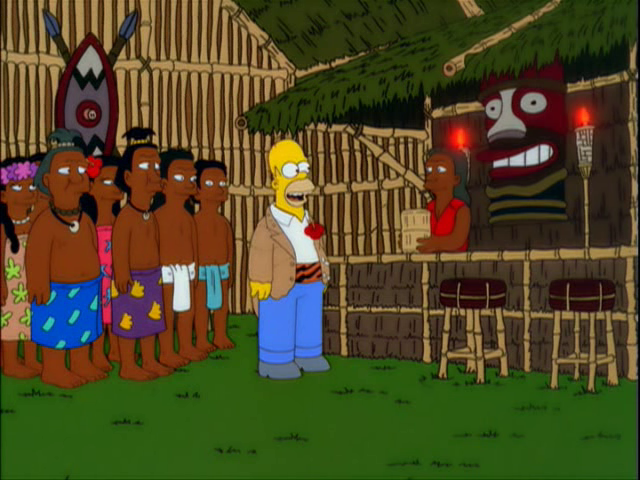 While the natives were noble savages ignorant of and unspoiled by civilization, Homer decides to build a casino on the island, which he names, "The Lucky Savage". This introduces alcohol, gambling, and violence to the island, and ruins the natives' virtuous way of life. After the failure of the casino, Homer builds a chapel in penance, but he and Lisa, Jr. ring the bell too loudly, causing an earthquake that releases a river of lava. The chapel (carrying Homer and Lisa, Jr.) starts to sink into the lava. As the two are about to meet their deaths, the scene cuts to another pledge drive, this time for the FOX network. It is revealed that Homer's adventures and mishaps were all recorded, while he was on the island, but the show as well as the network are in danger of cancellation. Various FOX show personalities are manning the phones, joined by a cranky Rupert Murdoch and hosted again by Betty White, who entreats the viewers to help keep "crude, low-brow programming", such as Family Guy, on air. Bart calls in and pledges a $10,000 donation. Rupert remarks that Bart has saved his network, to which Bart replies, "Wouldn't be the first time!". Modified on October 2, 2015, at 06:43.